Permanent, versatile, and aesthetic, dental implants are considered the gold standard of restorative dentistry and are one of the most popular options for replacing missing or severely damaged teeth. At Fresno Dental Professionals, our dental team is able to help patients regain healthy, beautiful smiles by offering a wealth of implant restoration options. By utilizing state-of-the-art technology and collaborating with experienced local oral surgeons, our Fresno dentists restore smiles through implant-based treatment options tailored to fit patients’ needs and lifestyle. Whether caused by accidental damage, extensive decay, or a consequence of failed root canals, a number of instances can cause a tooth to fall out or be so severely damaged that it must be replaced. While traditional restorations like bridges and dentures may provide some temporary relief, these options tend to further compromise smiles in the long-run and may ultimately require additional care. Dental implants are surgically-placed tooth replacements comprised of three unique segments: a titanium post, a connective abutment, and a porcelain restoration. As the implants become integrated into the jaw, they become a permanent part of the dentition, helping stimulate bone health, preserving jaw structure, and preventing natural teeth from shifting and changing bite position. 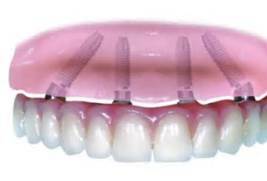 In addition to replacing single missing teeth, multiple dental implants can be used to support more extensive restorations, such as bridges or dentures, while protecting the health of adjacent teeth. For patients with existing dental restorations, implants can be used to stabilize partial or full dentures, improving an individual’s ability to chew, speak, and bite properly. As implants help reinforce jaw strength, they are also a reliable option for individuals with deteriorated bone density as a result of gum disease. Number of teeth that need to be replaced: This determines the type of restoration that will be needed to complete your smile and where implants should be placed to provide the most support. Condition of Jaw Bone: This determines whether preliminary bone grafting or other tissue grafting is needed to create healthy bone structure. This evaluation also allows our dentists to determine where implants would be best positioned. Aesthetic Smile Goals: Ultimately, our goal is to help you regain confidence in the look of your smile. By openly discussing your expectations, lifestyle, finances, and other personal factors that may impact your treatment plan, our Fresno cosmetic dentists are able to create a customized implant restoration that fits your smile. Once we’ve created a personalized implant strategy, we collaborate with trusted local oral surgeons for the placement of the implant and any preliminary treatments that may be needed. To ensure you are not without teeth during your recovery phase, Fresno Dental Professionals provides patients with temporary yet lifelike prosthetics that are fully functional. During follow-up visits, our dentists monitor implant recovery and begin finalizing your unique restoration. Utilizing advanced dental technology, we ensure your implant crown, bridge, or denture precisely fits your smile’s aesthetic, function, and health needs. Once the implants have fully integrated into the bone, patients return for final placement of their restoration. When teeth are lost, you lose confidence in your smile. Fresno Dental Professionals is here to restore your beautiful, natural looking smile give you your confidence back. To schedule your consultation, contact our Fresno dental team or schedule your appointment online. In this day and age, people have many options to replace missing teeth. While bridges and dentures are among the more traditional choices, dental implants are the most permanent, comfortable, and natural looking restorations available. At Fresno Dental Professionals, our dentists use dental implants to create attractive, healthy smiles in an innovative way. Because of their stability, durability, and permanence, dental implants are the ideal treatment to replace one or more missing teeth.